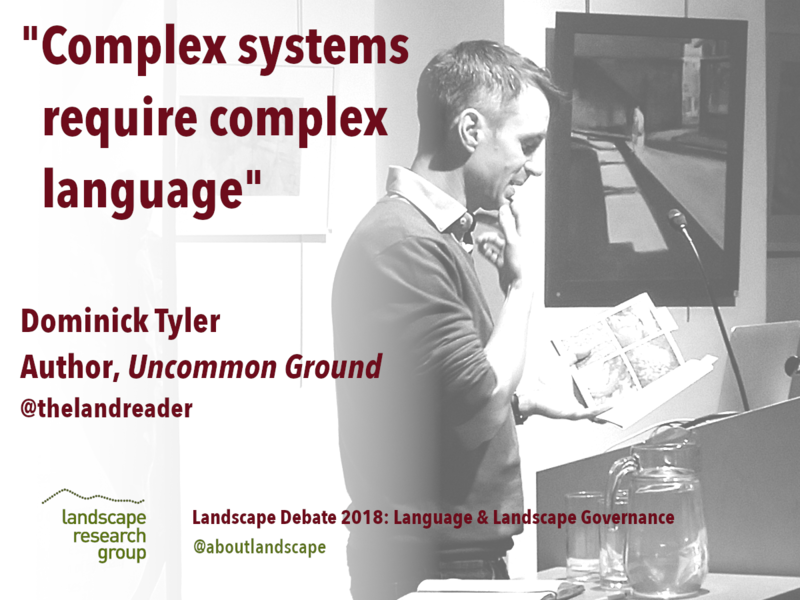 LRG’s annual International Landscape Debate was held in London on 4 December 2018, and explored one of the key themes in our Research Strategy: landscape justice, with a focus on language and landscape governance. The debate explored the relationships in language between the local and the global, from the four very different perspectives of our speakers: literature and landscape word-hoards, landscape architecture, public participation in landscape governance, and shaping regional and global perceptions, for example through the European Landscape Convention and UNESCO. Podcasts of their talks are below. The event also commemorated David Lowenthal (1923-2018), co-founder of LRG and the organisation’s former Chair. His book, Quest for the Unity of Knowledge, was also launched at the event, in partnership with Pages of Hackney and Routledge. 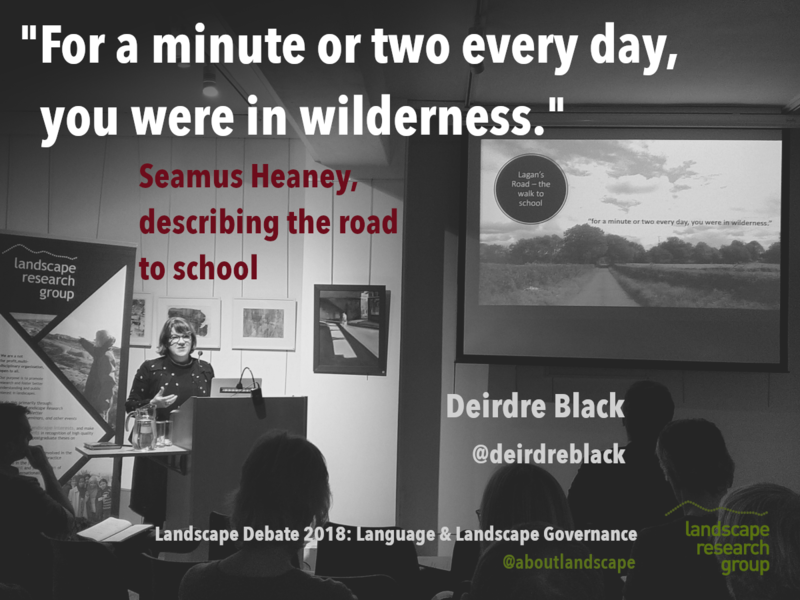 Deirdre Black is a landscape architect from the Republic of Ireland and is exploring the interface of the ‘technical’ and the ‘vernacular’ when it comes to talking about landscape. 3. 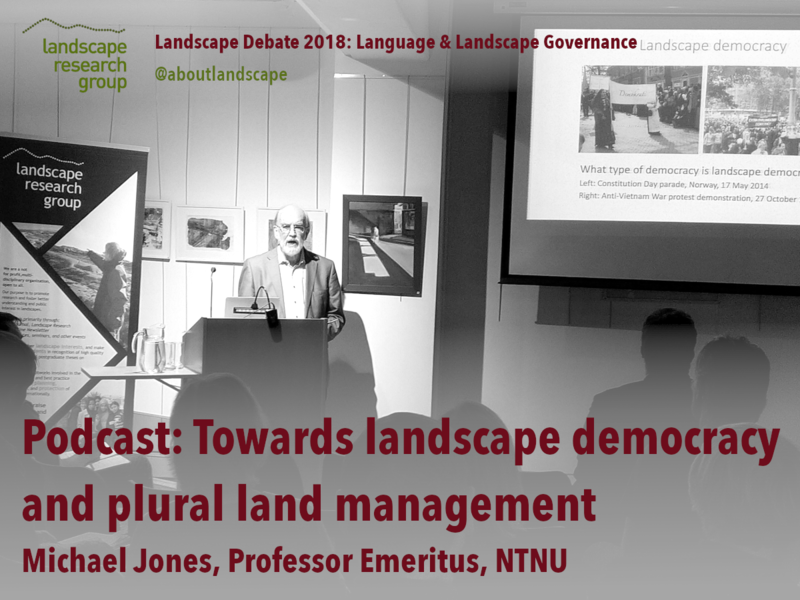 Michael Jones: From ‘cultural landscape management’ to ‘landscape democracy’ – from authoritarian to pluralistic management? Michael Jones is Professor Emeritus at the Norwegian University for Science & Technology, and is the former head of the Landscape, Law and Justice program at the Oslo Centre for Advanced Studies. His work has included the impact of language on the implementation of the European Landscape Convention, and public participation in landscape governance. Professor Sverker Sörlin is an internationally prominent environmental historian who was instrumental in founding the Environmental Humanities Laboratory at KTH Royal Institute of Technology in Stockholm, Sweden. The Laboratory sponsors the Stockholm Archipelago Lecture series, for which David Lowenthal was the inaugural speaker, much as he was the inaugural speaker for the present LRG lecture series. Sverker Sörlin co-authored the foreword to Quest for the Unity of Knowledge, and he will make a presentation of the book and its author. Alan Baxter Gallery (courtyard entrance) 77 Cowcross Street, London EC1M 6EL Click for map. The Landscape Research Group is delighted to welcome you to a special event for 2018: a combined debate and commemoration of David Lowenthal (1923-2018), co-founder of LRG and the organisation’s former Chair. A reception will follow the conference and book launch; everyone is welcome (included in the ticket cost). Tickets must be booked online in advance as we anticipate this to be a popular event, and space is limited. Book online here. The role of language in landscape governance plays out at a local to global level. The debate will explore the relationships in language between the local and the global, from the four very different perspectives of our speakers: literature and landscape word-hoards, landscape architecture, public participation in landscape governance, and shaping regional and global perceptions, for example through the European Landscape Convention and UNESCO. 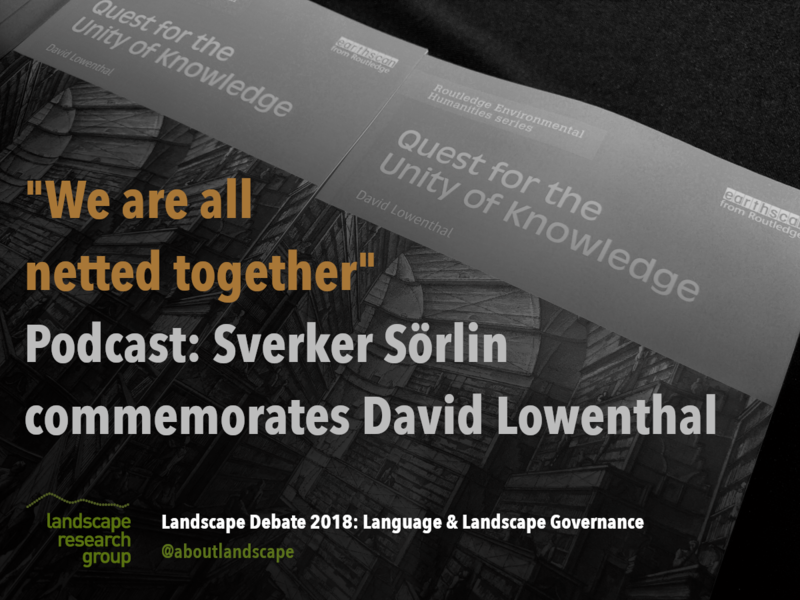 The theme of language and landscape governance is a thread running through the work of David Lowenthal, whose new publication, Quest for the Unity of Knowledge (due in mid-November) will be launched and on sale at this event. We are honoured that this is possible through a partnership with his daughter Eleanor Lowenthal and her bookshop Pages of Hackney, and publisher Routledge. David’s book and work echo the ongoing interdisciplinary approach of LRG, to examine and forge new relationships between fields. The role of language in enabling and facilitating landscape governance emerged as a key area for further research and exploration during LRG’s 50th-anniversary event last year, on Landscape Justice. The event will be chaired by Professor Hannes Palang who runs the Estonian Institute of Humanities at the Tallinn University, and is currently working on and with the language deployed in landscape ecology. He is a Director of LRG.